Apple Tree Yard is English novelist, Louise Doughty’s, seventh novel. It has sold more copies than Gillian Flynn’s, Gone Girl, (hardback) and rights have sold in twenty-one territories worldwide. It has been shortlisted for the Specsavers Crime & Thriller of the Year Official Mumsnet Book Club selection for January 2014 and has also been selected as a 2014 Richard & Judy Book Club choice. and turns, but that’s what makes it so utterly compelling . . . Writers, by-and-large, are a thoughtful, giving bunch, who do their best to impart nuggets of information that will spur you on to become the best writer that you can be. Crime fiction writer, Louise Phillips, goes out of her way to do that and more – and she succeeds. Two of her students have recently signed with literary agents, one (Jax Miller) with a major six figure publishing deal! 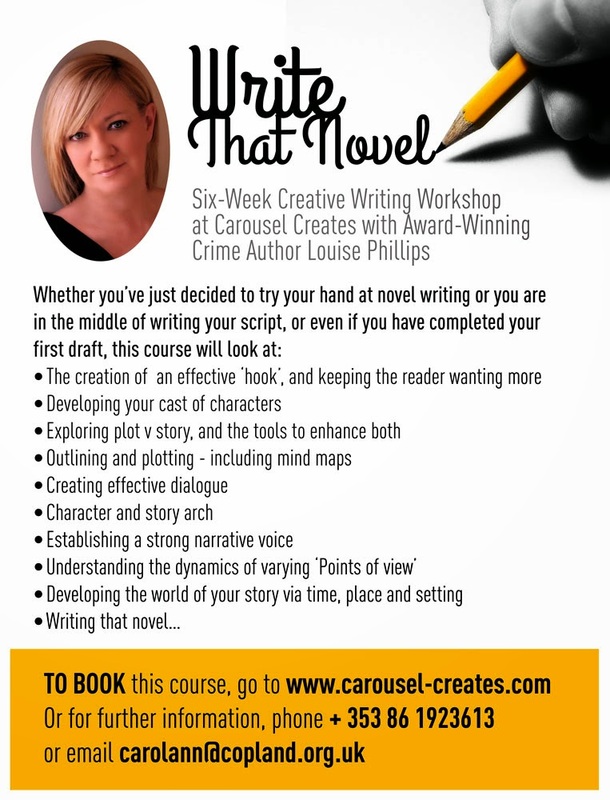 So if you are a writer with plans to start, finish or rework existing novel material (inclusive of memoir) then Louise Phillip’s, Write That Novel course, is for you. It begins on 30 April in Carousel Creates and costs €120 for the six weeks – but be warned, it’s already booking up fast! Louise Phillips is bestselling crime author of the psychological crime thrillers, Red Ribbons and The Doll’s House, Winner of the Best Irish Crime Novel of the Year 2013. Her work has been published as part of many anthologies, including County Lines from New Island, and various literary journals. In 2009, she won the Jonathan Swift Award for her short story Last Kiss, and in 2011 she was a winner in the Irish Writers’ Centre Lonely Voice platform. She has also been short-listed for the Molly Keane Memorial Award, Bridport UK, and long-listed twice for the RTÉ Guide/Penguin Short Story Competition. In 2012, she was awarded an Arts Bursary for Literature from South Dublin County Council.